Our internal medicine specialist at Peak, Dr. Dani Rondeau, handed me a little gift bag last week when I arrived at Peak. Inside was a personalized food bowl she’d made in a pottery class for Wilbur, complete with a drawing of the little tyke in the bottom of the bowl. It’s hard to tell from the photo, but in the drawing Wilbur is not only sporting his trademark tongue-out motif, but Dani had him wearing his own little tuxedo as well (we call him “Tuxedo Sam” because of his white tuxedo markings on his chest). I took the photo the other evening after Wilbur had eaten?his dinner, looking quite pleased at being able to see his portrait when he’d finished. He even stuck his tongue out for added effect. We’re sure he feels like a special boy to have his very own personalized food bowl! How sweet of her to honor him like that……. That’s very sweet, and quite a compliment to Wilbur! WOW…how nice and great job Dani. .
Well, little Wilbur has worked his magic charm on another. I wonder if Dani even knew she was under his spell!. I’m guessing your troupe of four legged critters has charmed many at Peak and the other specialists as well. 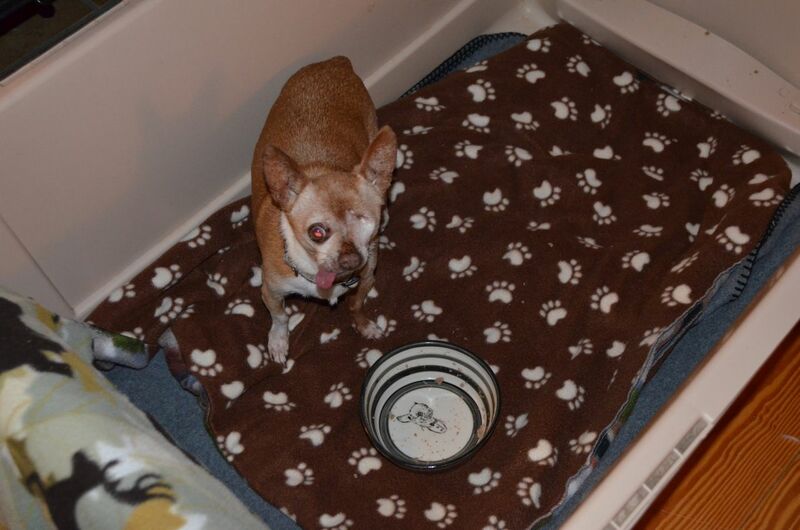 I can see Wilbur dressed in a little pirate suit with an eye patch — ARGH, MATEYS! I’d like to know from other blog readers if anyone is able to click on the photos to enlarge them like we were able to do with the old blog. Steve said it should be working but I have yet to be able to do it regardless of my PC or browser. If you are able, could you please tell me what browser you are using? Thanks a lot. I clicked on the photo of Wilbur and it was actually larger than it used to be in the old blog. I use IE 11. Barb, I use Google Chrome for my browser, and it works fine. I love your new website and blog. Beautiful! I just realized today, wondering why I wasn’t getting updates anymore as I was subscribed to your blog. Not sure what happened. But I’ve subscribed again so I can keep up with the happenings at your farm. Looking forward to getting your blog posts again!! That bowl captures his essence beautifully! I think the doctor has a second calling. Would she do that on request? That would be a great fund raiser as an auction item.